The Never Summer Funslinger is a mellower more freestyle oriented version of the Proto Type Two and one of our favorite freestyle rides. Other than a little fine tuning here and there, not much has changed over the years from the 2015-2019 Funslinger so it still has a very similar personality to the first year it came out. I still have my 153 from 2016 and love to use it to compare to other freestyle boards I try. The Evo used to be one of our favorite freestyle rides but after only a day on the Funslinger, we all liked this better. Conditions: Pretty much every type of snow except for really deep powder. After 1 foot I don’t want to ride it. Sizing: The 153 really fits Peter and I (James) really well. The 156 felt a bit big but still doable if you want a softer mountain ride but at that size I’d rather be on the 157 Proto Type Two. For Jimbo and Zobel the 154x is a much better call for their size 11’s and they booted out on the 153. Flex: Nice soft playful rubbery med/soft flex but it’s also got some snap to it. Very fun to butter around the mountain and the extra camber makes less easy in a good way to flex it as well as get some return out of the tip/tail. Approximate Weight: The NS Funslinger 156 weighed 6 lbs but remember all boards do not weigh the same. Wood cores vary in weight because wood grows so just know that it feels normal to the lighter side of normal underfoot. We didn’t weigh the 153 because snowboard weights are just too inconsistent. On Snow Feel: Now this augmented camber hybrid rocker board has a pretty stable ride that is close to some hybrid camber boards we rode. As far as hybrid rocker goes it’s about as easy as it get’s one footing off the chair and flat basing as we have seen. It’s a shade behind many hybrid camber boards with camber in the middle but way ahead of most hybrid rocker boards. It’s got a nice confidence inspiring freestyle feel to it underfoot that has a little all mountain freestyle aftertaste. It’s a fun board for playing around the park most of the day but also it’s not going to be weird if you take it out on the mountain. Turn Initiation: As I said in the video I love this turn initiation. The 156 bordered between medium/fast and super fast. It was quick enough when you need it but not too quick/easy to be boring. Turning Experience: I was surprised at how much fun it was to make good mid to wide radius turns on the mountain. With the Evo, it wasn’t anywhere near as rewarding. Back when all boards were camber even the softer boards were pretty fun to turn and this revisits that feeling without bringing back the catch of camber. Even with its soft flex, the turning experience is super fun and as long as you go slower you can have a lot of fun making all kinds of radius turns. The turns complete a little faster than I would like and I think it’s because the rocker hurries it up but it’s much better than the Evo with the extra camber in the tip/tail. Carving: What a bonus here. That flatter profile and especially extra camber made this board a lot more fun than you would think for such a soft playful twin. I could really lay into a carve here and the board didn’t hurry out of the carve that quickly compared to most hybrid rocker boards like this. I’d get a nice flex into the carve off that camber in the tip/tail and a nice spring out of it. It was great for laying into a carving turn regular, then switch, then a butter and then an ollie. Most people don’t care too much about a park ride that can carve but it’s a nice bonus that gives it more of an all mountain freestyle aftertaste. You didn’t have to get your knees out towards the tip/tail like you did with the Evo to keep it from washing. Instead, you can make a knee together surfy carve without it getting too washy and that’s a lot of fun for myself and many of our crew. Edge Hold: Really solid edge hold. These are brand new edges and they held well. If you jib a lot with the Funslinger then you will lose this grip but it held well over the hard patches I encountered in the early season snow I was riding in. Powder: It’s a centered stance twin that rides a little shorter so it’s not ideal for powder. It floats well for what it is but can’t handle much without a lot of back leg power. Speed: Not a bomber by any means but you know that going in. It did surprise me on how damp it was for the flex. Never Summer boards provide a more damp ride than other boards out there so what they rate low on dampness is pretty high compared to other boards of this flex and riding style. It also might be the extra camber in the Ripsaw Profile that gives the Never Summer Funslinger a more stable less chattery ride than the Evo. The tip and tail didn’t bounce like they do with the Evo and it’s standard Rocker & Camber profile. Uneven Terrain: It’s not a chunder buster but if you have to negotiate a Saturday afternoon groomer that’s been torn up it’s no problem. It moves over and around bumpy tracked out snow at slow speeds like water over rock and it doesn’t get cranky on ya and the bumps don’t reverberate up into your joints. Switch: Asymmetrical boards like the Funslinger just make switch riding better than even true twins because the heel side is easier to turn. This is only true if you ride with a duck or very close to duck stance. The Asymmetrical side cuts actually make turning more symmetrical regular or switch but we really feel it switch because most of us aren’t as strong switch as we are regular. What we also love is that it’s asymmetrical without a Gumby tip/tail so you barely notice it’s asymmetrical which is cool. Even cooler is you can lean this up against a wall and it will stay there instead of fall to one side and possibly take a few boards out with it. Buttering: The Never Summer Funslinger really butters well and it bends really easy between the feet. That’s hands down the softest place on the board and it really makes it easy to butter. Also, the extra camber in the tip/tail helps you get more pop out of a butter. It’s super fun. Jumps: It’s got lot’s of pop and it’s got lot’s of ollie powder. It’s also really great on the small early season kickers we came across. Our guess is it’s only weakness will be on really big kickers as I feel most might prefer a board with a little stiffer flex. Other than that it’s so forgiving and so perfect. Jibbing: I’m not really a solid jibber but this board is and it’s a confidence booster. The flatter profile makes it easy to slide and Jimbo had a blast in the park. Pipe: Pipes aren’t up but that extra camber seems like it would drive you through the flat and help you climb the wall pretty well. This isn’t as strong in the pipe as it is in the rest of the park but if you keep the edges sharp this isn’t a bad pipe board and it’s not bad for lapping the pipe. So all in all this extra camber, flatter more stable design and asymmetrical tech make this a really fun park board that we’d like to own. I’d actually like to size down to a 153 and make it even more playful and parky. We try to get as many images of the Never Summer Funslinger, but forgive us if they're not all there. Longtime Proto Type 2 rider looking for a more flexible and poppy twin...Bingo. Funslinger 154X is perfect. Park riding isn't my thing, but the Funslinger turns the whole mountain into a playground. Good ollie pop, extra waist width for sharp carves, super easy switch. It's livelier more nimble than the Proto, which is a bit too stiff and maybe better suited to a heavier rider than me. Recently picked up this board and it has exceeded my expectations. I got the 156cm. It holds better at high speeds than I expected but it is definitely not a charger. Turn initiation and rail are incredible. Tons of pop and buttery yet still holds its own on medium jumps. Haven’t hit anything huge yet so I can’t speak to that. Great option for someone who is about jibs and jumps. Prolly the Best board of all time. Its just amazing and fun. Not for charging tho. If u wanna charge get the ripsaw or proto. This is the perfect park board. If the snow is soft U can charge with this board but its really meant for park.It has so much pop and rides rails like a dream .Amazing board.for buttering and switch. Edge hold is amazing. Love regular camber but ripsaw camber is amazing and next best thing. Just cant say enough about this board. Been riding for about 25 years now,had more boards than I could name and always take at least three with me,last trip(March) I got a funslinger 157 and in the twenty five years boarding I have never had such fun! 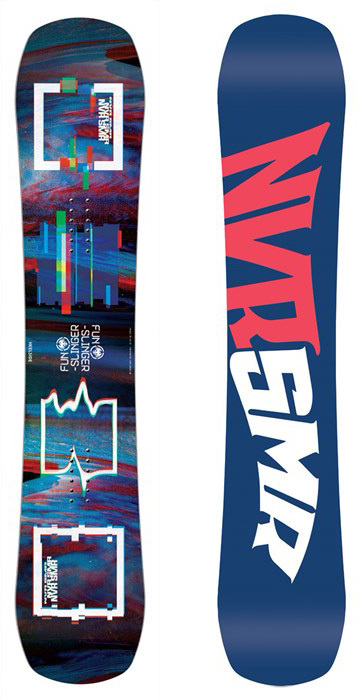 So easy to use and you can do anything on it,needs a bit of care when you max it out,but still holds a good edge and deep powder needs a good technique to get the best out of it,but what a board,can't rate it highly enough and can't wait to use it this December! Got this board to replace my Burton Whammy Bar in the park. This ended up being my all mountain carver and park board. This board makes it so easy to turn the whole mountain into a park. Rollers become jumps with every trail you ride. I find that, regardless of this being a park/ freestyle board, I can lay out fast deep carves. The asym heel edge helps a lot when spinning frontside. Love this board. Will ride it until it dies. If you read the specs on this board, you'll find it does everything intended, and I think more. It's true that at high speeds the funslinger won't feel like the ripsaw (firmness). However, the funslinger handled my type of fun: open mountain steep groomers w side hit backside 540's pressing into a switch nollie FS 180 over a knuckle then charging 40 mph slasher bombs and reverse carving out switch...yeah it's THAT board. Fast flex and FUN. My ripsaw 160x still feels more confident at high speed, but that's to be expected, right? With that said i don't need to break 60+mph every day...and gps tracked 57mph - to 0 with toeside brakes on the funslinger felt sturdy. Because of this ability, combined with the playfulness, it lives up to it's name slingin fun everywhere it goes. For the last 2 years i've been riding the NS evo along mixed in with a few GNU's. Overall I have to say the Funslinger is a step up from the NS Evo. I was able to give this board a full test up at killington, which included laps through the park and steeps. Overall the board handled everything very well. But really excelled in the jibbing and jump game. I was able to pop in and out of turns on steeps without issue and really cruise and gain some speed without feeling unstable. It held up quite nicely on ice even after a full detune. The board is relatively soft, butters and presses were an ease but it still maintained a good amount of pop with the exaggerated camber.